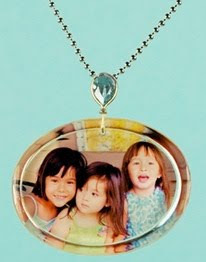 Little Windows takes your favorite photo and turns it into a treasured piece of jewelery. You can choose to have your jewelery made for you. Or, if you are feeling adventurous, you can choose to make your own jewelery. Little Windows sent me a Make 3 Kit to review. For the same price of having one custom-made photo necklace, I can get a DIY kit where I can make 3 necklaces on my own. Hmmm… There’s me and two loving Grandma’s. Yup, that makes three! You get everything you need in one kit to make three necklaces and a little bit more. When I received the kit, I read the instructions and watched the online tutorials to make sure my first attempt at necklace making would be a success. 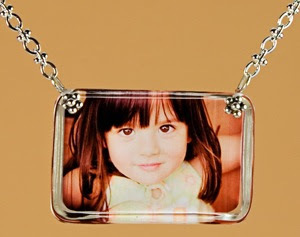 There is software right on the Little Windows site where you can automatically resize your photos so they will fit into the mold for the necklaces. I cut out the pieces, and mixed my resin and hardener as per the instructions. I was able to make three necklaces. While they were setting, I decided to make some domed magnets as well (the instructions for doming are on the site as well). I mixed more resin and hardener and was able to make 14 domed photos. They are of Baby Bird, Papa Bird and me. I will be attaching magnets to them and taking them in to work to display in my office. The verdict — I really enjoyed making these necklaces. It was a little slice of me time. I waited until Baby Bird went down for a nap, then took my coffee downstairs and set to work. Everything was very easy to do. I had a little problem with one of the pins that I needed to thread through the pendant to attach to the chain. It ended up snapping of on me and there wasn’t enough pins there to have a “do over” so I ended up pulling out my craft kit and threading a string through the hole to attach it and you can’t even tell that I made my own “fix”. The other two turned out perfect and will be going to two very happy Grandma’s. The Little Windows Make 3 Kit sells for $48US on their website. So, what is your favourite piece of jewelery? My favorite is the multi-photo necklace. My favorite is the square necklace. I like the cube bracelet! The 5 cube necklace looks FAB! Thanks!!! I love the 2 photos combined necklace. I love the sterling heart necklace. I like the 3/4 circle necklace. It's the perfect size to stand out but not be too lound. I love the medium shape bracelet, thanks! I like the large oval necklace. Thanks for the contest! I like the small square necklace. I like the 3/4" small square necklace. I really like the double sided domed necklace. Great for someone (like me) with 2 kids! i like the multi photo necklace! Sounds like fun for my daycare kids! I like the My 3 Girlies necklace! I love the cube braclet! This is a cool idea. I like the large shape cast bracelet. Love the Kira flower necklace! I really like the necklaces in a frame! What a neat idea. Great xmas present for Grandma! I liked the pretty Anna Oval. I adore the charm braclets! I had to favorite these in Moma's wish list folder on Daddy's laptop. hehe Great giveaway! I signed up for the Little Windows newletter. The donut necklace is adorable. Thanks for the chance. The donut necklace is cute! My favorite piece of jewelry is the double-sided domed bracelet with pearls. It is really pretty and what a conversation piece. I'm going to order one for my mother-in-law! Thanks for the chance to win!! My favorite is the We love donuts, with a heart charm necklace. I would love to give that to Grandma for Christmas. I like the 5 cube necklace! MY favorite piece there is the single small cast cube bracelet! Very cute! Wow! This jewelry is gorgeous! What Mom wouldn't want this??? I went to the 'Little Windows' site, and my favorite piece of jewelery would be the multi-photo necklace. unique ideas at this site!! I really like the magnets! I think that that the cute and casual cube bracelet is really great. I would love one of these. I like the black and white picture in the round pendant, but I would like it on silver chain. I love the Gabby necklace. It's really neat. My favorite piece of jewellry…..isn't actually jewellry. I really liked the idea of having my "peeps" put on magnets. I love the Swarvoski crystal pendant with black necklace. Gorgeous! I like the 2 stacked sepia. I liked the set of 4 magnets. I would like to purchase a square shaped simple sterling ball necklace with the black cord..really thinking 'bout getting this for my two little God children..would be so cute! I like the pictures that have the writing on them, either their name, or an inspiring message – perfect for gifts! What an awesome idea! I am an early bird entrant! My favorite is the rectangle pendant turned sideways (I know the exact photo I would use in it!!!!) with either the sterling silver snake chain or black leather chain (can't decide on the chain right now). Here is my additional comment as an early birder! Wow, how cool. I really liked the look of the double-sided bracelet- "domed with pearls". I would definitely order from here! P.S. I am an early bird draw person!